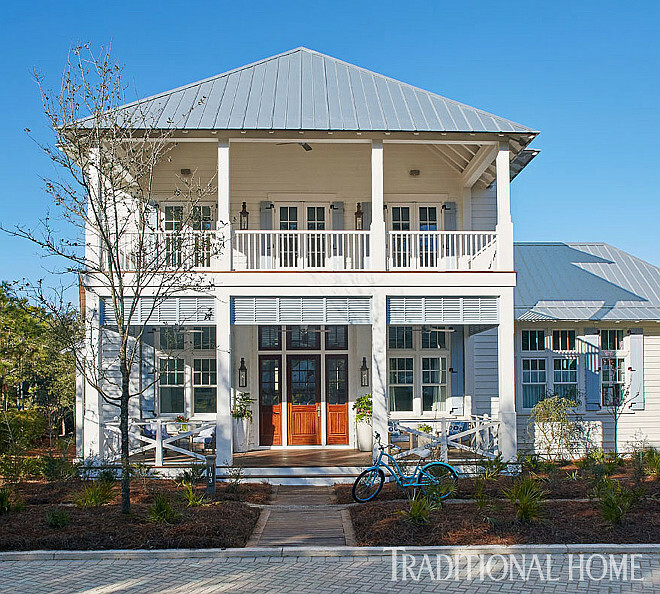 Is there a better way to start summer than by featuring beach houses from Florida? 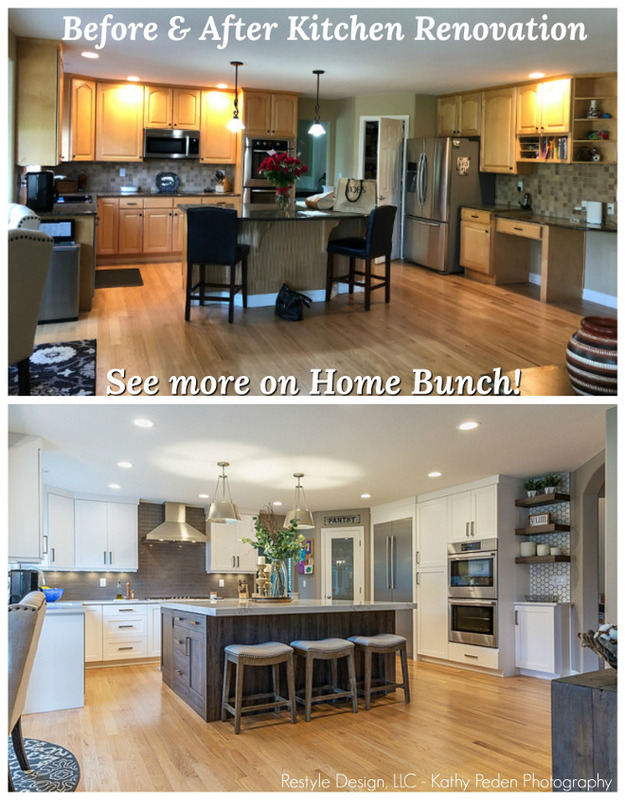 I’m taking this post as a “virtual vacation” and I hope you come along! 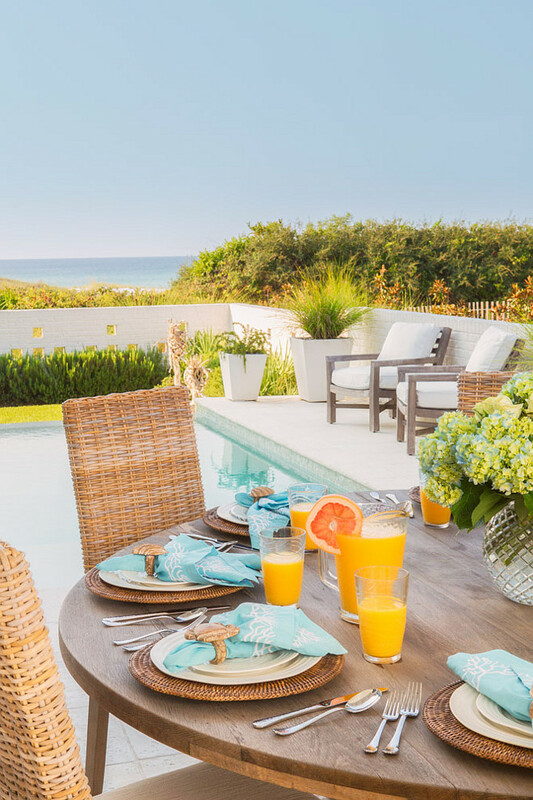 Featured in the June issue of one of my favorite magazines, Traditional Home, this Florida family vacation home is where this large family comes to take a break from their busy life in Atlanta to relax and enjoy the surrounding beauty that only Scenic 30A has to offer. Designed by T.S. 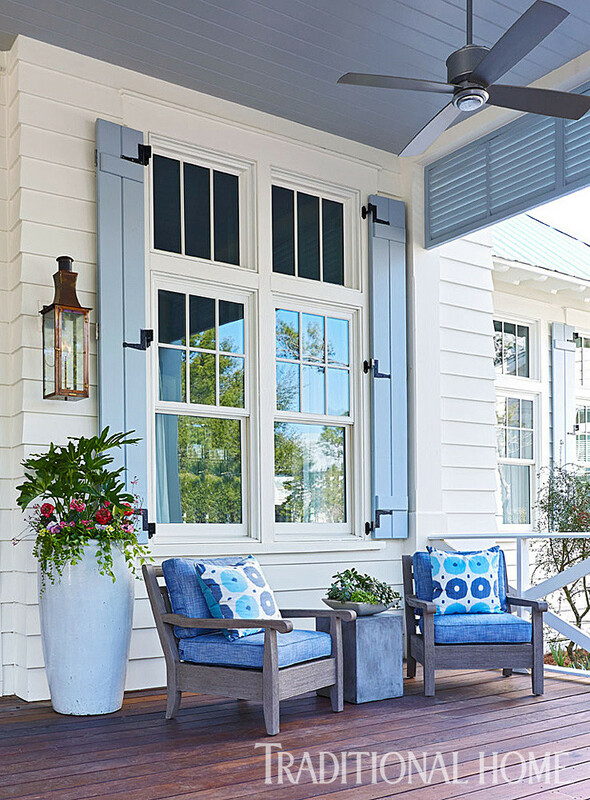 Adams Studio and interior designers Mary McWilliams and Kenson Bates from Mary Mac & Co, this home is truly a fresh take on a classic Southern farmhouse with expansive double porches, wide steps, tall windows, cheerful blue shutters, and a metal hip roof. 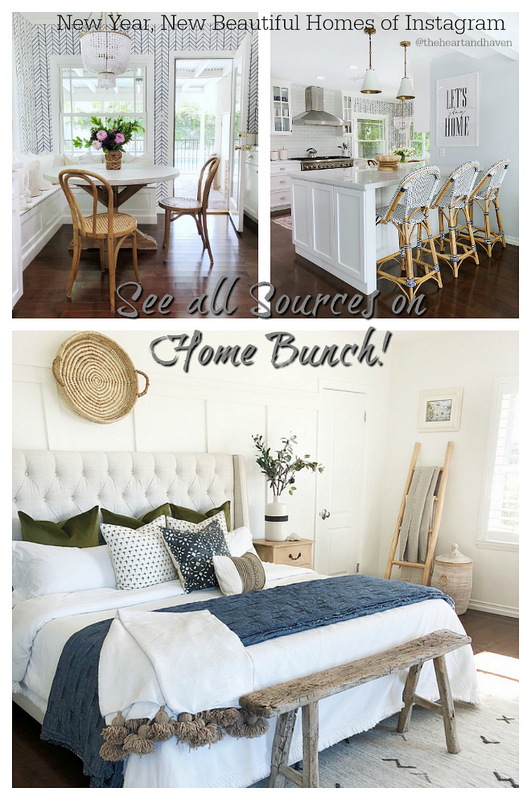 The interiors are inviting and casual with a hint of elegance. Now, take a break, put your feet in the air and let’s feel the great energy this vacation home has. I know you will feel more relaxed and inspired! 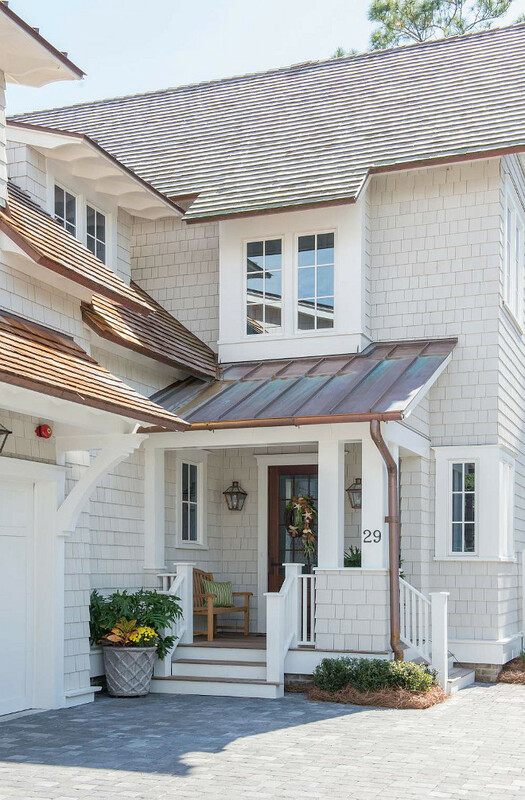 Everything is beautiful around here — the weather, the beach and this home! 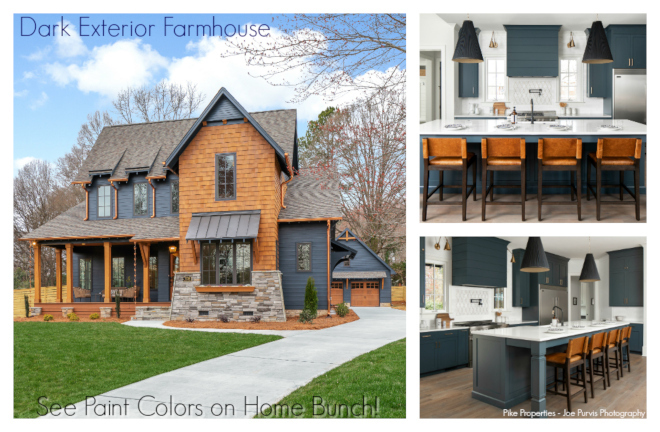 The siding, trim and shutters are James Hardie. The lanterns are “Governor Bracket Mount” by Bevolo. Chairs are Leagrave Classic Lounge Chair”/Weathered from Restoration Hardware. Cushion Fabric is “Textured Linen Weave”/Navy, by Perennials. 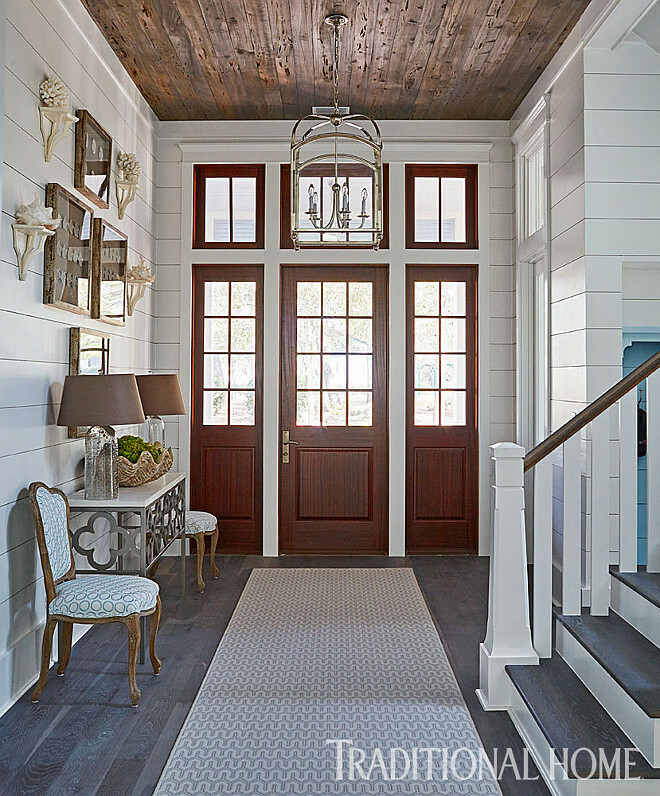 The foyer features stunning architectural details such as shiplap walls and reclaimed Pecky Cypress wood ceiling. Console table is “Lucy Smith Quatrefoil Table”/Champagne with limestone top from Holland & Co. – similar here. Side chairs are Berthe Side Chairs from Zentique. Giant shell is from Ballard Designs. Rug is “Baltimore”/Seaspray from Stanton Carpet. 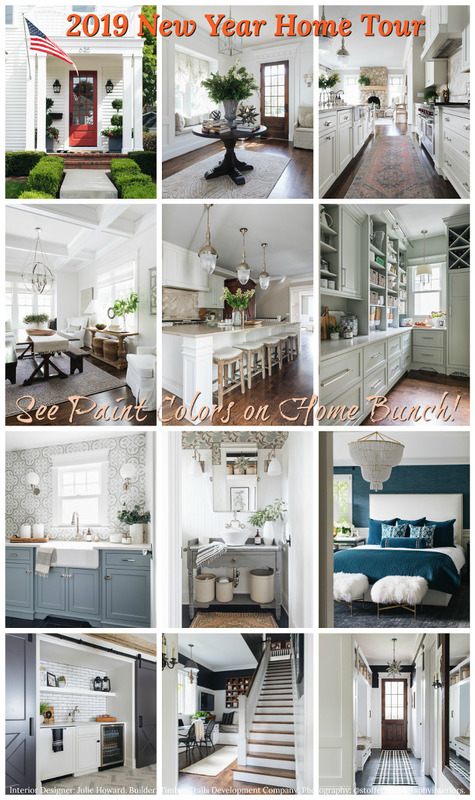 Paint color is Decorator’s White OC-149 Benjamin Moore. Shell shadowbox art is by Jamie Dietrich. 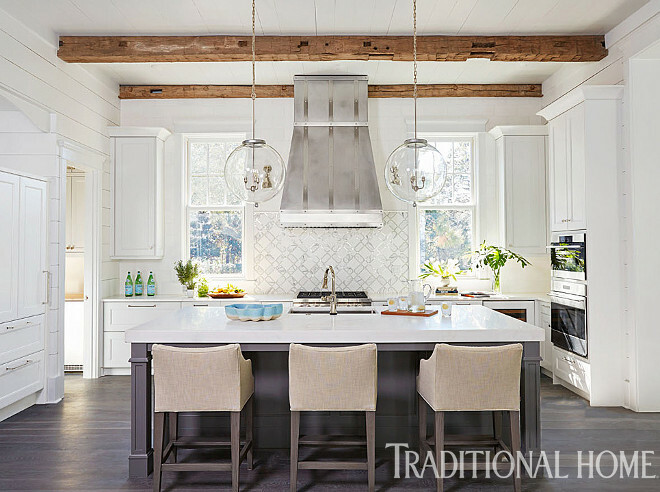 Isn’t this kitchen breathtaking? 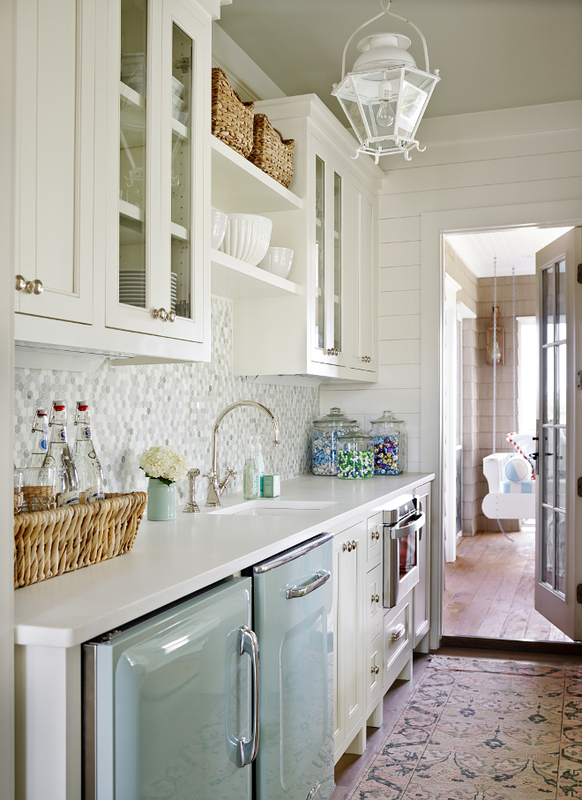 A custom hood is centered on a waterjet-cut marble-and-glass tile backsplash. 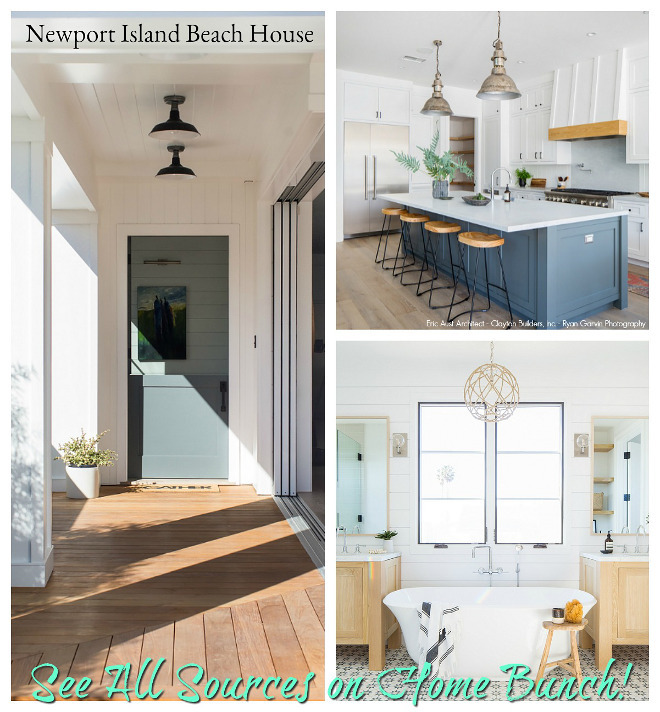 Glass orb pendants were custom-designed for above the island. Backsplash: Custom Waterjet Backsplash in Marble & Glass from Renaissance Tile & Bath. Kitchen Pendants: “Vintage Glass Bubble Light” from South of Market. Countertstools are “Campaign Counter Stool” from Lee Industries. Fabric is “Cap Ferrat Weave”/Pebble #65931 from Schumacher. 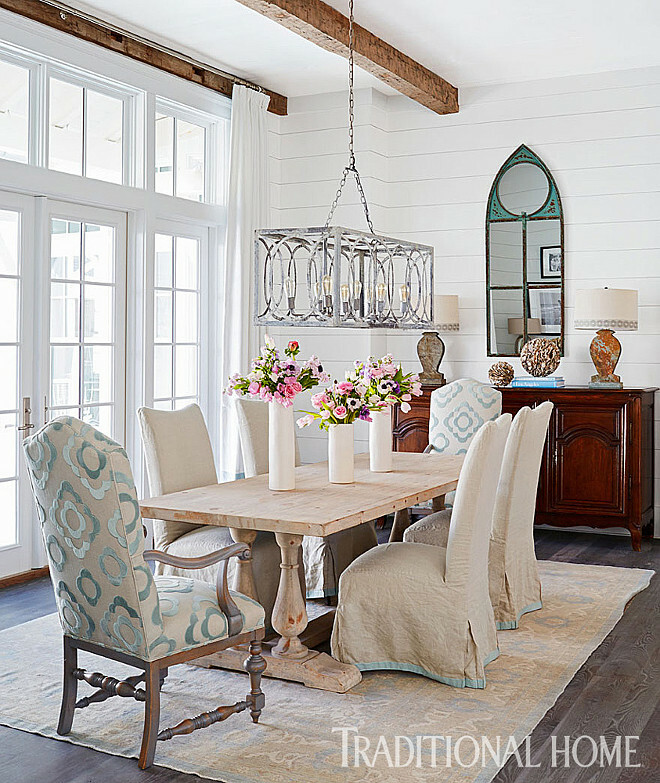 When it comes to the dining room, the soft blue tones of the Oushak rug inspired the decor, including host chairs covered in a Lee Jofa fabric. 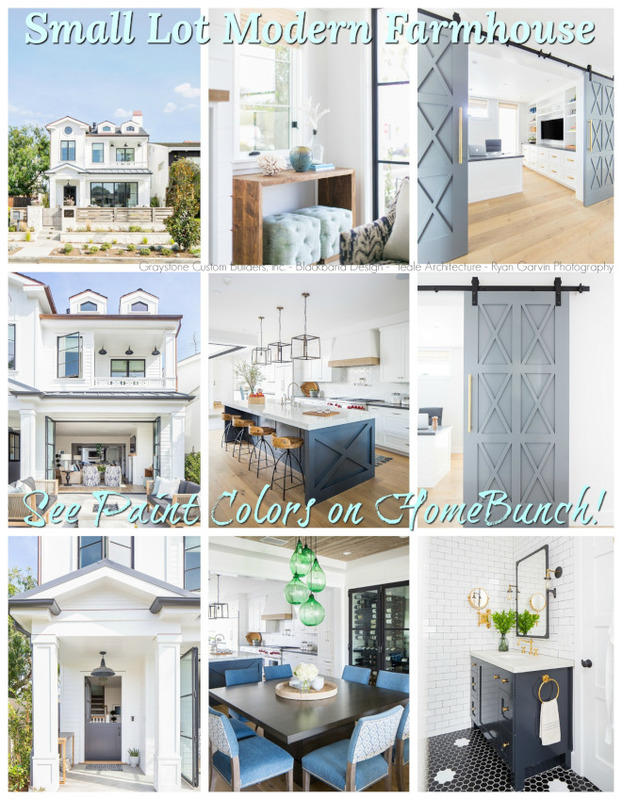 Chandelier and dining table are from Beau Home Interiors. 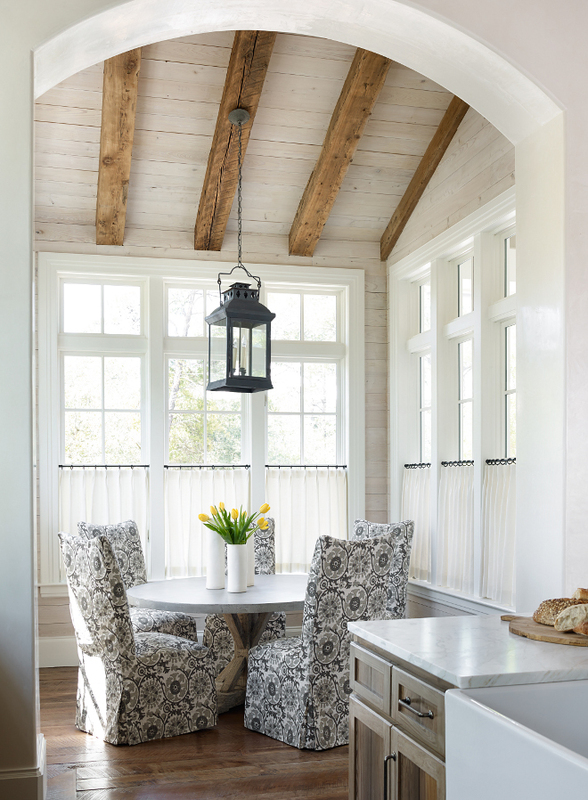 Paint Color: “Decorator’s White” #OC-149 from Benjamin Moore. side chairs are “1.5-inch Cambridge Strie Braid”/Glacier Blue #977-34161-15 from Samuel & Sons. 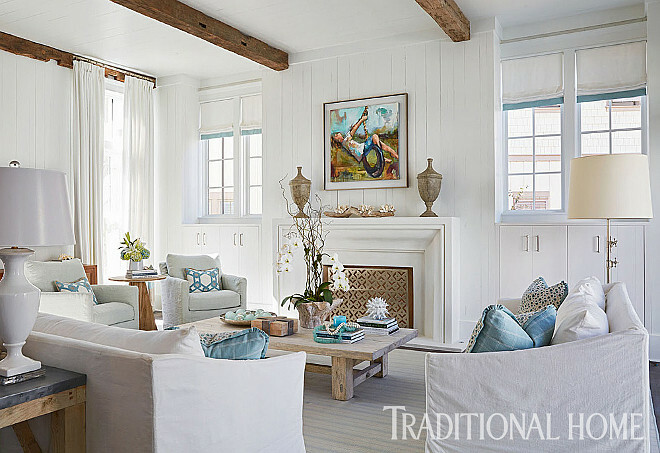 In the living room, white linen upholstery provides the backdrop for splashes of blue that appear in various shades on pillows and accessories. 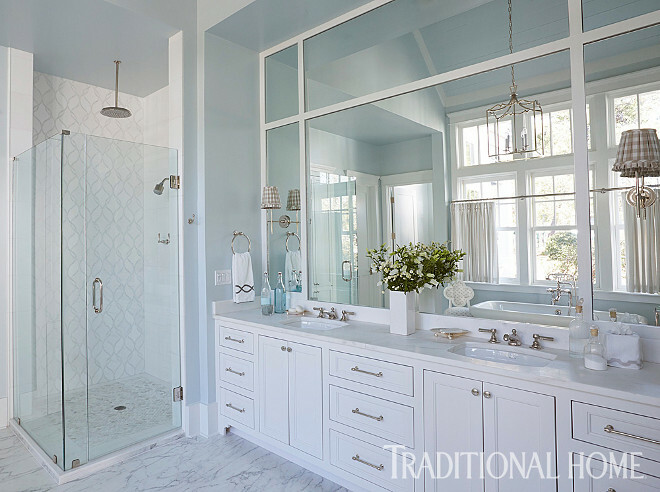 Those blue accents add interest to the calm palette. 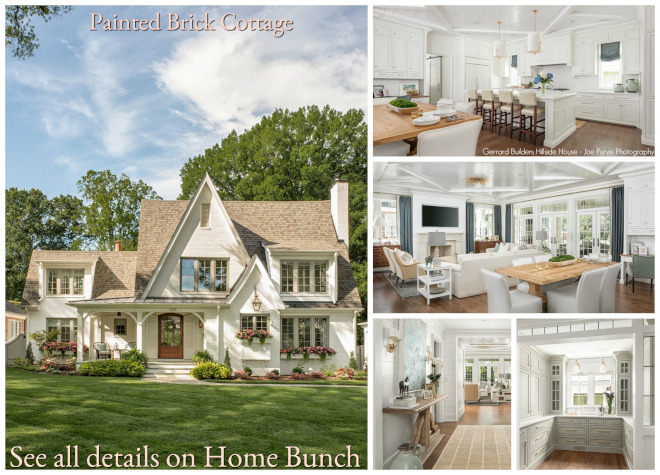 Paint color is Benjamin Moore OC-140 Decorators White. Sofas are #C3071-03 with “Burbank”/Ivory fabric from Lee Industries. Coffee table is “Reclaimed Elm Plank Cocktail Table” #F2-FNH8551TL-LE from Bungalow Classic. Art over mantel is by Lisa Moore Fine Art. Rug is “Bellucci”/Ice from Stark. 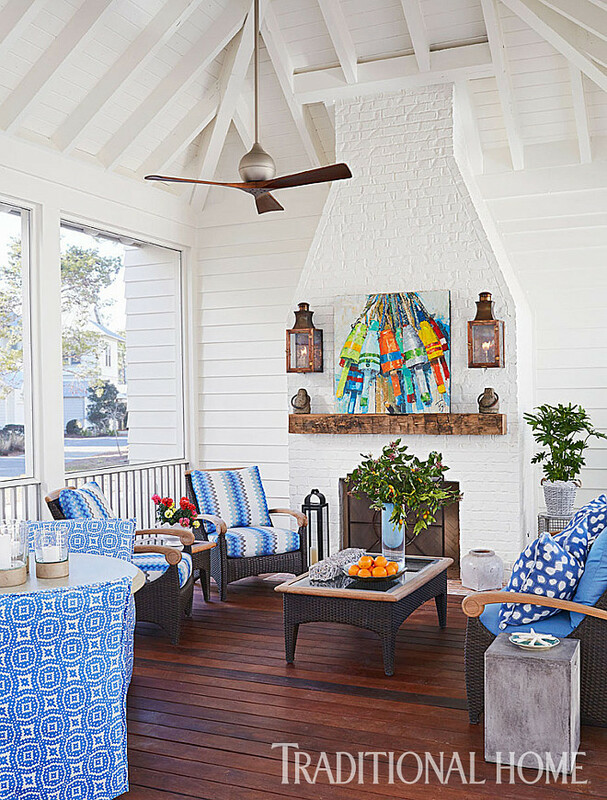 A fireplace and 10-inch-wide antique oak plank floors create an indoor feel to this screened-in porch. 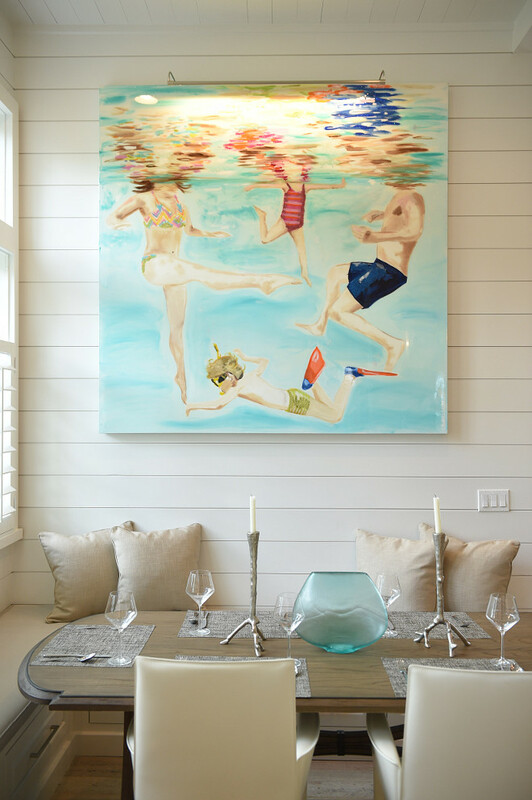 The cheerful Buoy’s Club painting above the mantel is by North Carolina artist Trip Park. Lantern sconces are from Bevolo Gas & Electric Lights. 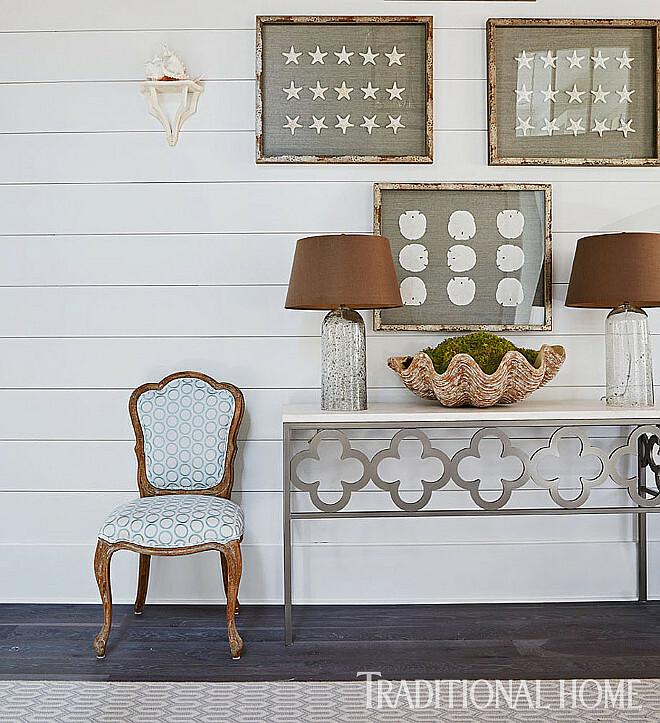 This small home office is more than what you need in a vacation home, right? 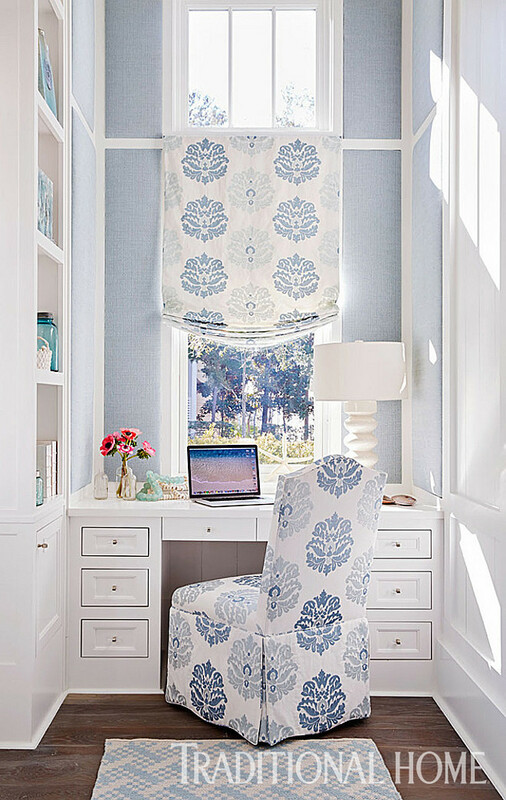 A Jane Churchill fabric in shades of blue and white dresses the window and desk chair. 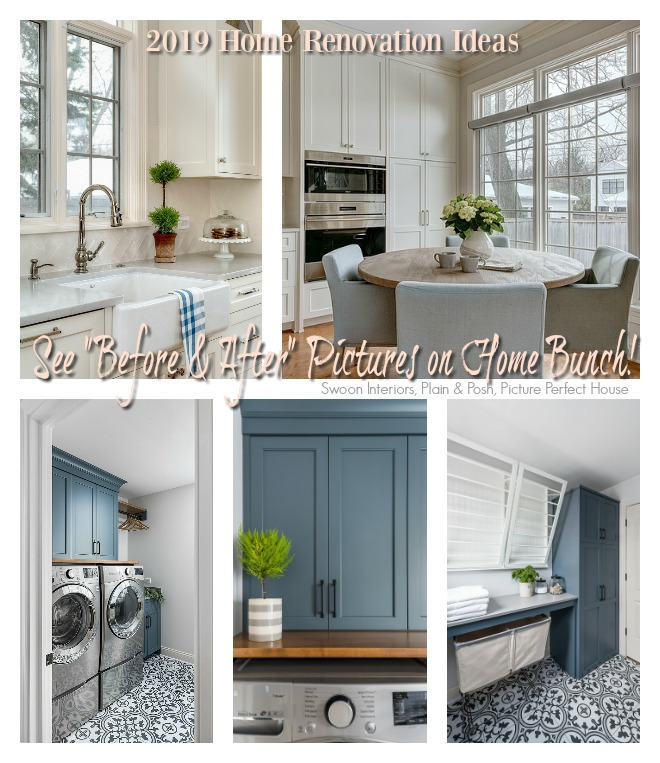 Trim and cabinet paint color is “Decorator’s White” OC-149 by Benjamin Moore. Lamp is “Wheaton Lamp” from Arteriors. Rug is “Hudson Blue Indoor/Outdoor Rug” from Dash & Albert. 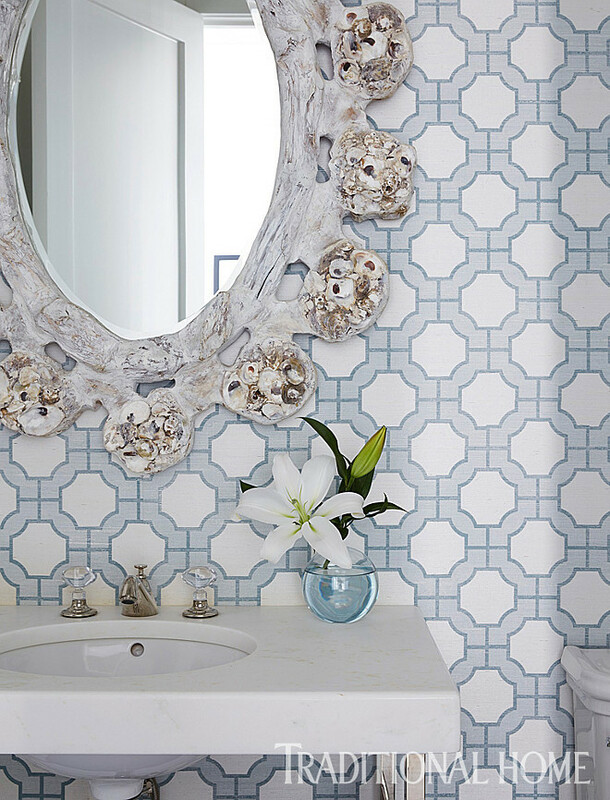 A Webb Marstelle mirror makes a statement in the powder room. 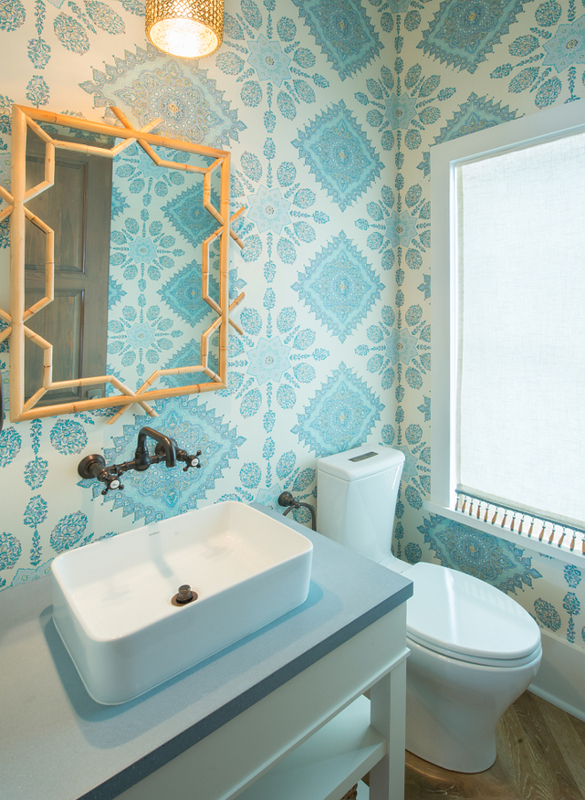 Wallpaper is “Imperial Gates”/Dove and Harbor Blue on White Manila Hemp #5192 by Phillip Jeffries. 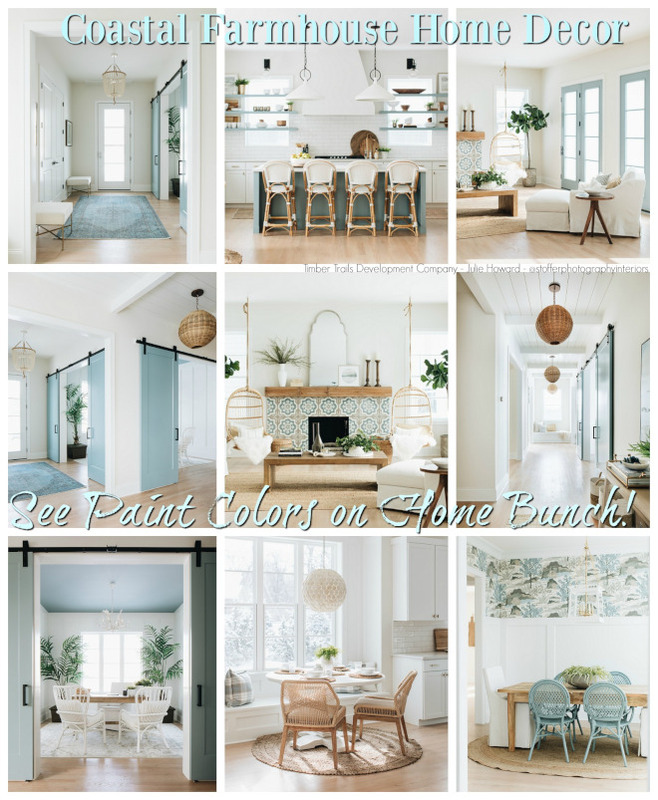 Paint color is “Cloud White” OC-130 by Benjamin Moore. Vanity and faucet is by Waterworks. 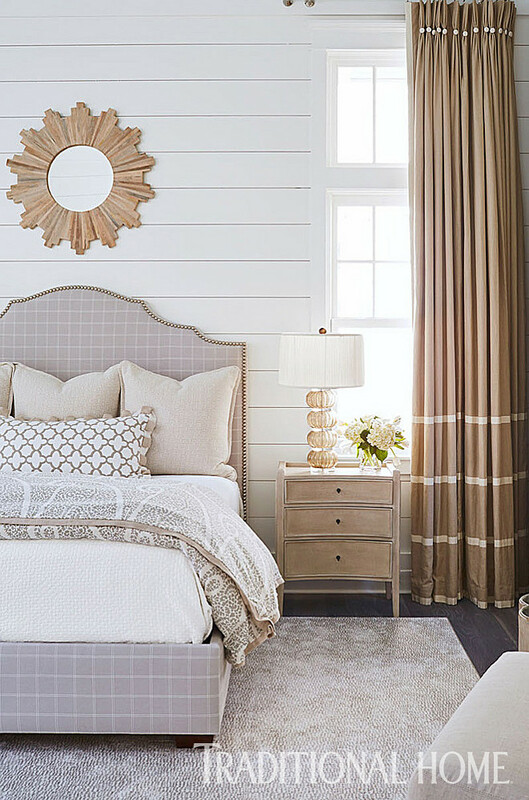 Wall paint color: Benjamin Moore Decorator’s White. Bed is custom with “Chatham”/Chrome #V3144/11, by Villa Nova – Romo fabric. Mirror above bed is “Nouveau Sunburst Mirror” #T11414 from Wisteria. 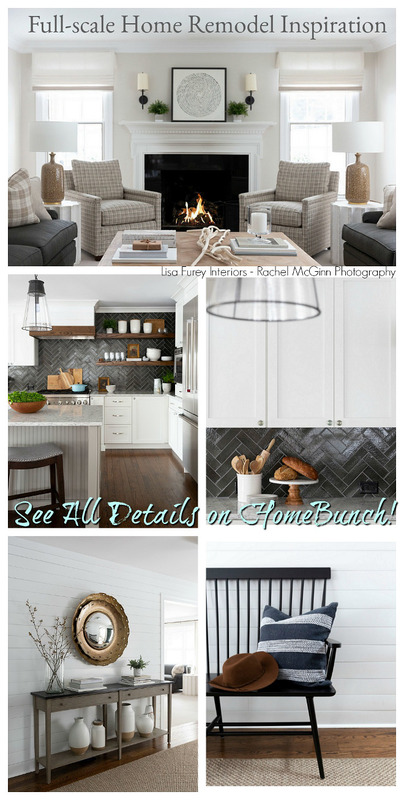 Cabinetry hardware: “Lugarno Pull”/Polished Nickel 6-inch from Restoration Hardware. Sconces are “Bryant Sconce” from Circa Lighting. Sconce shades are “Minack Check”/Beige #F4143-01, by Colefax and Fowler from Lee Jofa. Chandelier seen in mirror is “Darlana Medium Fancy Lantern”/Polished Nickel. “Farrow and Ball 235 Borrowed Light”. 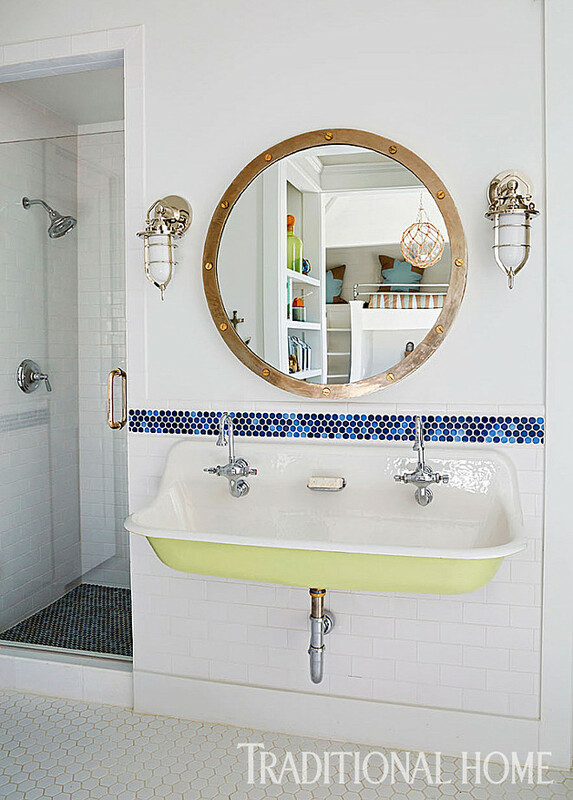 The polished nickel étagère and soaking tub are from Waterworks. This bunk room features one full-size bed and five twins. Hanging light is “Rope Net Glass Sphere Chandelier” from Shades of Light. Sconces by beds are “Nauticus”/Silver #20290-SAT from Masterpiece Lighting. Rug is “Bo Blue Woven Cotton Rug” from Dash & Albert. The underside of a Kohler trough sink is painted Benjamin Moore 2146-40 Pale Avocado. Wall paint color is BM Decorator’s White. 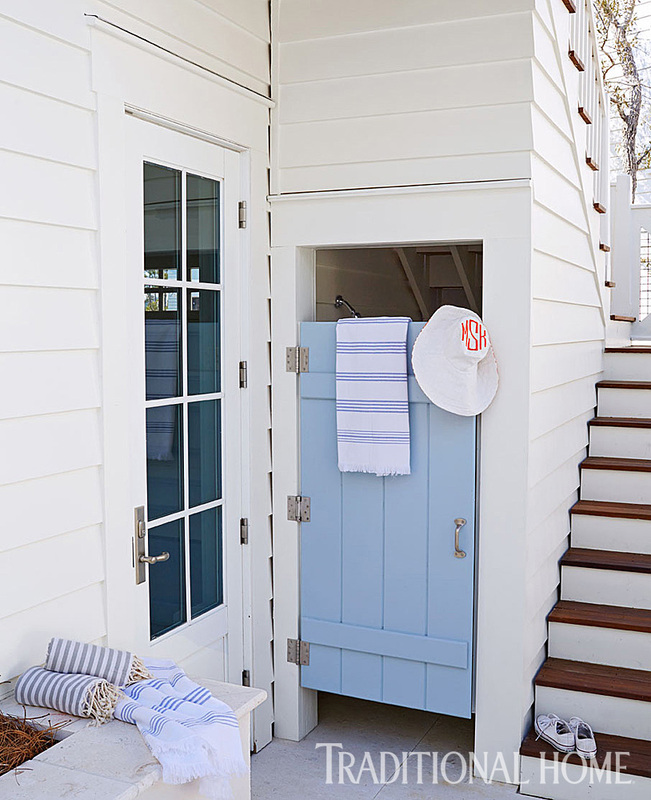 An outdoor shower is tucked under the stairway. Isn’t it a brilliant idea? Architect: Tim Adams from T.S. Adams Studio. Interior Design: Mary Mac & Co.